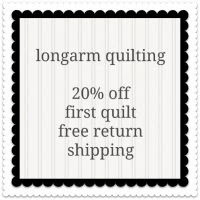 I'm fairly new to an established quilt group. Very talented and inspiring women. We're in the midst of a block exchange. Each month, we take a new pizza box, more details about it here. 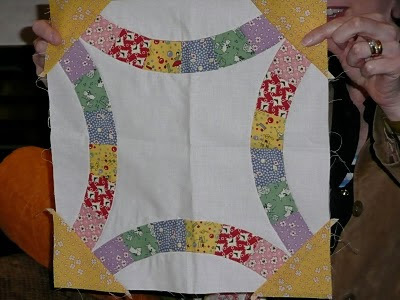 Here's my block (yes, it needs to be trimmed). I was trying to be easy -- everyone's got 30's prints or pastels, right? But there are some fabric colorways, I have no stash or idea where to get coordinates, so I've been sneaking & taking the easier ones first. I got Mary's this month -- black & white. I'm in search of the ultimate basket block. Thought I had found it, but this pattern isn't so smooth, but I made it work. Baskets make me happy, so does pizza. Got a little bit of chocolate on the block, ooops, but I think I got it out. Brown goes with black, right? 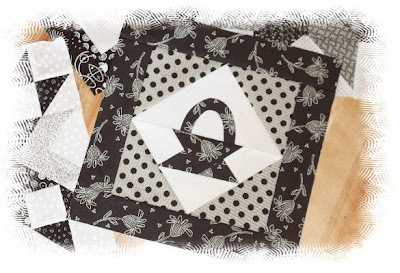 your basket block is really nice in those fabrics. which i love. don't have much in the 30's but your block is very nice. and getting together is a nice way to reflect on what you have done. i don't get the box being empty though. i like mine full of pizza! ooohh, what a sampling of delights! chocolate, repro's, baskets and pizza! 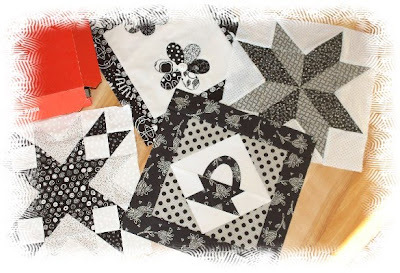 Pretty pretty blocks Corrie! Yum pizza and chocolate are my favorites. I really like your block Corrie! It looks nicely done to me! Talk to you later this week. Thanks for the "home delivery!" It is fun to belong to a group. 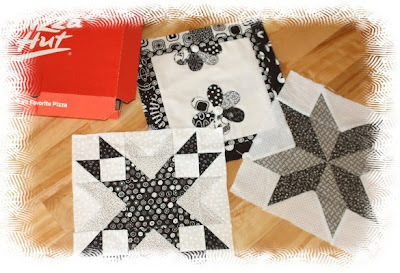 Went to the groups blog and there was a flip & sew star she is doing next month...any chance on getting the pattern??? Thought more Christmasy patterns though?? Maybe a kit? ?